Intelligence Response Team have arrested a kidnapping gang who abducted a MOPOL commander in Aba, Abia State. He was trained as a policeman to fight criminals but ended up as one. Nemesis has however caught up with him and four other members of his kidnap gang after they successfully abducted and collected ransom from their victims; among them a police officer. They were arrested by detectives attached to the Inspector General of Police (IGP) Intelligence Response Team (IRT) less than two weeks after they kidnapped a serving Mobile Police (MOPOL) commander in Aba at about 8pm on January 14, 2018. The suspects identified as Ifeanyi Stanley Ekpelulor, John Alozie, Ogbonna Wesley, Eze Obinna and Eze Orji, abducted Unit Commander 55, ASP Solomon Nyakno Aniefiok and collected his service Beretta pistol. He was later released after paying an undisclosed sum to his abductors. 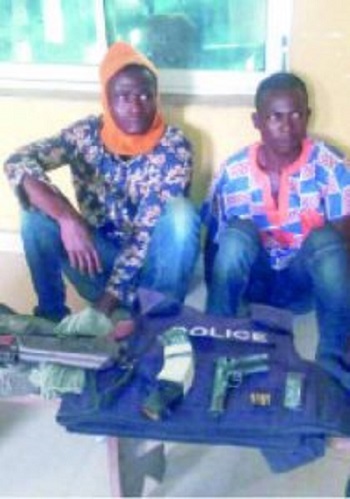 On their arrest, a police source said they were all picked up at various locations in Abia State through intelligence gathering generated by the police in Abuja. At the police station, Ifeanyi aged 37 who is the leader of the gang, told detectives that they never knew the man they picked on January 14 was a policeman till he attempted to kill them with his pistol. “I am from Osisioma in Abia State. After my secondary school, there was no money to further my education, so I learnt to drive motorcycle popularly called as Okada. I was among those who were shortlisted to join the police in 2006. "After five months training at the Police College, Ikeja, Lagos, I was dismissed. They caught me with one other person smoking indian hemp. I had no choice but to return back to Aba and start my life all over again. “After several years, I got a job to drive a Sienna bus for one man. Unknown to me, he was a kidnapper. One day, I was in my house when police came and arrested me. They said I should produce my boss, that he is wanted for kidnapping. Since I could not provide him, I was charged to court and sent to prison. I spent almost two years in prison before I was granted bail. While I was in prison, I made a lot of friends and we agreed to help each other when we finally leave the prison. On the kidnap of the Mopol Commander, Ifeanyi said they were on random picking of victims when they spotted him on the road in Aba. “ We saw him standing by the roadside talking with a woman. We assumed that he is rich because of the Jeep that he was driving. We simply walked over to him and pointed the AK47 at him and grabbed him. We pushed him into the Jeep and drove off to our hideout at Nnekute bush in Aba. “On our way, he pulled out his gun but luckily, the boys who were at the back noticed it and overpowered him. They beat him thoroughly until he agreed to cooperate. It was then we realized that he is a policeman and we became extremely careful.